Brazil is the largest country in both South America and the Latin American region, but also the world’s fifth largest country - both by geographical area and population. Bounded by the Atlantic Ocean on the East, the country has a coastline of almost 7,500 kilometers and its Amazon River basin includes a huge, tropical forest, which is home to a very diverse wildlife and a variety of ecological systems and extensive natural resources with numerous protected habitats. Its climate comprises a wide range of weather conditions - very common is a country with such varied topography - but most of the nation is typically tropical, with a classic warm and wet climate. In terms of biodiversity, Brazil comprises different ecosystems, such as the Amazon rainforest - recognized as having the greatest biological diversity in the world. It is estimated that the total number of plant and animal species in Brazil could approach four millions. Brazil is, therefore, the perfect destination for those looking for a close contact with unspoiled nature, but also seeking all the comforts a metropolis - such as Rio or Brasilia - can guarantee. 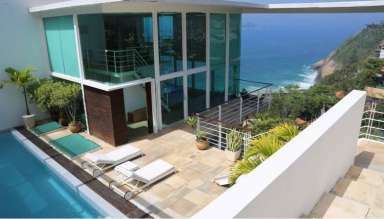 Take a look at our luxury villas in the area, and book your unforgettable vacation in Brazil now.